You must make reservations at least 5 minutes in advance of the time at Sagano Japanese Bistro & Steakhouse. We are located in the city of Brighton and therefore we share parking with all of the other businesses. There is limited street parking available but plenty of parking available in multiple municipal lots. There is a designated drop off spot immediately in front of our building. The rear doors are for emergency exit only so please use the front doors. 2003 Sagano Bistro established in Flint Township Mi. 2005 Sagano Flint expansion adding 10 hibachi tables. 2009 Sagano Brighton, featuring 12 hibachi tables and one private dining room. 2010 Sagano Flint expansion 4 additional hibachi tables and an additional grill dedicated to cooking to go orders. 2013 Sagano Clarkston, 13 Hibachi tables, a full size bistro and 2 addtl. hibachi tables dedicated to cooking to go orders. 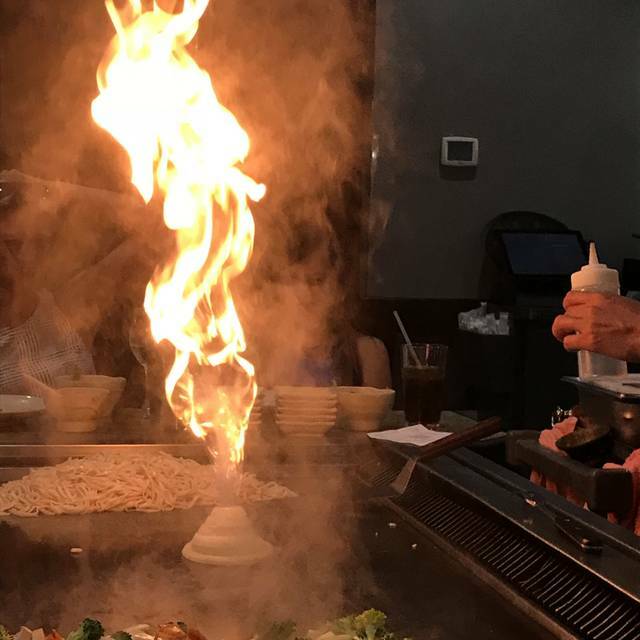 Our homemade soups, salad dressings, and sauces, combined with high quality beef, chicken, and seafoods prepared by skilled and entertaining Hibachi Chefs has made Sagano Steakhouse a favorite. Our Bistro side (not available in Brighton) is perfect for a quicker, quieter meal, offering the finest sushi. Great time and great food. We come here for all our birthdays! Love this restaurant ! We will come again ! For a Sunday at 5pm very busy we were rushed to our table ,server struggled but the food is always good ! Everything service and food was fine. We did have a reservation and the table was not hot enough so we had to sit for 20+ minutes before we could get started. I at least thought that deserved a round of soft drinks or something. Besides that, it was fine. Everyone was so kind and helpful. Great service. We will come back again . The food was very good. Excellent service. Our chef was fun and engaging. Food was good and overall nice experience. Poor service. Left finished glasses and dishes on table creating clutter. Soup was disappointing. Out of Saporo beer at 6pm??? I heard the waiter tell other of being out of a few items. Food was average taste and over priced. We love going to hibachi for dinner. It seems to be hit or miss at Saganos though. Our chef and food were excellent. Our service from our server was beyond poor. It's such a shame they split the tip 50/50 because our Chef deserved more than 20%, but our server deserved much less. It’s hit or miss when you go if you get a good, fun chef. I paid for Birthday package and the girl took pic with a phone because they said they were out of ink to print said she would send pic to me but never did. They were out of coffee and chef was very dull not entertaining at all. I have taken my family there several times. It is always a fun and enjoyable evening. It is a little on the pricy side but you are paying for the show. Plan on about 1.5 hours for dinner. Always a great experience and great show! Will return! Great food!!! Lots of fun!! Absolutely fantastic experience. Seated quickly, promptly waited on. JonJon was our chef and he is just great. Good sense of humor, good skills, great at keeping the table involved, and INCREDIBLE customer service. I spilled the half of my beer on the table and my plate on accident and he got me a whole new beer plus a new plate of food. LOVE the food here. I would eat there a few times a week if it wasn't so loud - I suffer from migraines and have headaches almost every day. I miss having a bistro side that was quieter. Although the food was good, the waiter we had was an issue. He had a loose bandage and gauze on his hand covering a wound. Whe he served our table's soup, he placed his entire hand over the top of the bowl covering the top and his dirty bandage touched the rim...very unappetizing. When he served our salad, his finger was inside the bowl when he served each one. It grossed me out and actually made me lose my appetite. Great Food Loved our Chef!! We were seated right on time. Our server was very attentive. Our chef was entertaining, engaging, and the food he prepared was awesome. We were seated very quickly...but waited quite a while before the chef came. 'sWaitress was fine. The chef was nice but he definitely can't cook. I was warned by my grandson that he was the worst chef, and when he came to the table, we were sad. The patrons next to us told us the very same thing. So, we knew up front, it was not going to be that good. For all the hype, the meals we paid $85 for was not worth $25. The steak was tough, dry and overcooked. The shrimp was dry, the chicken was dry. The noodles were flavorless. The fried rice was the best of the whole dinner and that is not saying much. I even told the other patron to go to Kyoto' Japanese Steakhouse if they wanted excellent food compared to this meal. I will not return nor recommend the Brighton Sagano to anyone. Very disappointed and feel "ripped off" for such awful food. Loved it! Perfect for my son’s birthday! We will definitely be back soon! Fun place to go when you want food and entertainment! We have been there many times, the purpose is to have good food and be entertained. The food was great, the chef was not. He did a couple of standard tricks. His dameaner and interaction was not entertaining at all. Maybe he had a bad day, but it was my daughters birthday, she was very disappointed. We will be back, just hope we don’t get him again! We had a reservation for 7:00. We were seated at 8:00. Normally not a big deal, but being a week night, and both my wife and I were looking to be home at a relatively decent hour. Caused a bit of an issue. The staff was friendly, but clearly over booked. The chef didn't come to the grill until around 8:50, so we almost asked for our check to leave. I've been here multiple times since they've opened, and am not sure I will return; at least during the week. The server was slow and the cook was not good a cooking. We had an 6 pm reservation and didn’t start eating until all most 7pm. The cook like to talk and joke around more then He like cooking the food. We have been there several times. And the food and service has always been better. My rice was hard( most like it was over cooked) , my veggies were over cooked and my steak was not medium. Amazing value!! Soo much food and great entertainment!! Highly recommended. Good food, fair pricing, and unique atmosphere. The hibachi experience is definitely fun. The chefs are very friendly. You do sit with other parties around the hibachi grill, so if you're looking for a more private dinner you can request normal table. Great family valentines experience. Kids and adults enjoyed. And enough food for dinner the next night. Good food, great service for our special family dinner. The service was friendly and the food was tasty. I’ll go again. Always great food and show!! Really enjoy the cooking along with the talent from the chefs. Brought Family together for my wife's Birthday and a good time with good food was had by all. The chef was funny and still able to cook everything just the way we wanted. Noise level was high but not distracting. The chef tossed shrimp to our grandson's mouth perfectly much to his enjoyment. We all said we will come back again....Birthday or not! Prices are good...Groupons make it better. Hong, our chef for the night, was a notch above normal Hibachi chefs as he exchanged with the table.